When it comes to animals, Alfred Hitchcock – who died 33 years ago today – is perhaps most readily associated with the (man-terrorising) birds that chilled cinema-goers in his famed 1963 thriller. But in choosing his pets, the master of suspense opted for an altogether more affectionate companion: the Sealyham Terrier. Hitchcock was certainly besotted by the breed and is known to have owned at least four Sealyhams in his lifetime. The first was Mr. Jenkins, who, along with an English Cocker spaniel named Edward IX, accompanied the Hitchcock family when they moved from England to Hollywood in 1939. Reflecting on the family’s reaction to the transition, Hitchcock noted that the dogs “seemed to have no opinion on the subject. Grass is grass”. The director’s later Sealyhams were named Geoffrey, Stanley and Sarah. Geoffrey and Stanley appeared in The Birds as part of Hitchcock’s cameo – the three saunter out of San Francisco’s Davidson’s Pet Shop just as Tippi Hedren enters – and were the namesake of his production company for Marnie, Geoffrey Stanley Inc. Hitchcock also presented a Sealyham to Tallulah Bankhead, star of his 1944 film Lifeboat, as a token of thanks for her stoicism in carrying on filming after contracting pneumonia. She named her dog Hitchcock. Not a huge amount is written about Hitchcock and his beloved pets, save that he was devoted to them and fed them “better than most people,” making regular trips to the butcher to get the finest cuts of meat ground for their delectation. 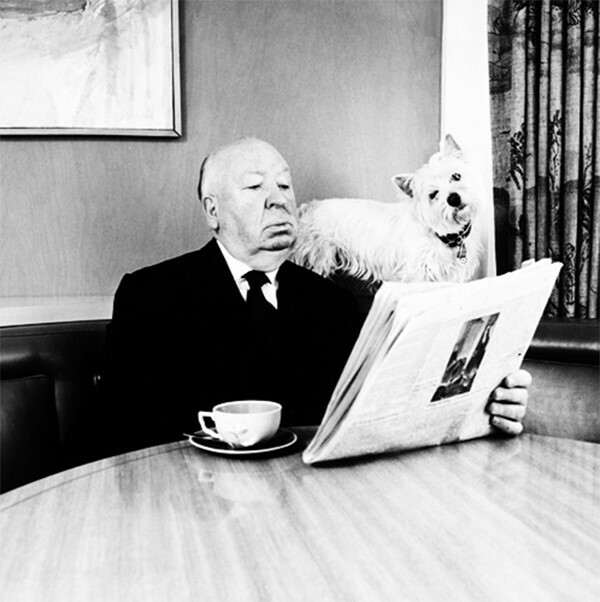 In fact, it is in his films that Hitchcock’s admiration for the canine species reveals itself most profoundly. There, dogs proliferate – always, in the words of Hitchcock biographer Patrick Mcgilligan, “amusing, brave and intuitive about the distress of their owners”. Indeed, François Truffaut once noted that the slaying of a dog in Rear Window is portrayed in “hue and cry...as if the death of a child were involved”.